Khammam MPTC/ZPTC Election Results 2014. Khammam District ZPTC MPTC Reservations 2014. Khammam MPTC/ZPTC Results 2014. Khammam MPTC ZPTC reservations have been finalized and published. Elections will be held on 6th of April 2014. District officials are busy with the arrangements. 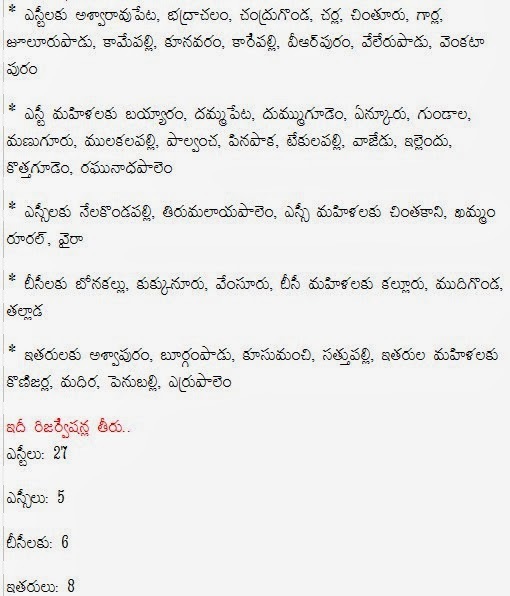 Khammam District Voters List for MPTC/ZPTC Elections 2014 will be released soon. The following mandals are in the districts and the following picture shows mandal wise reservation for OC, OC Women, BC, BC Women, SC, SC Women, ST, ST Women.